The debate on women’s health care used to center on abortion. It has now expanded to include the availability of contraception and the “right to refusal” — so-called consciousness clauses that allow pharmacists to refuse to dispense emergency contraception, employers to opt out of providing insurance coverage for birth control, and health care providers to refuse emergency care for pregnant women. Barber, as do most Americans, believes that the “availability of contraception was an issue we settled 50 years ago” and employers, insurance companies, and pharmacists should not put themselves between a woman and her doctor. Arizona’s 8th Congressional District encompasses much of Pima and Santa Cruz counties, as well as Cochise County. To find out what district you live in, click here. “I will be a strong voice to make sure that basic contraception continues to be available to women. I will vote against any proposal to defund Planned Parenthood,” Barber promises. Though many of the laws on this issue are being implemented at the state level, he says that he will oppose any restrictions on contraception and be a voice of support for access to contraception at home in Arizona. 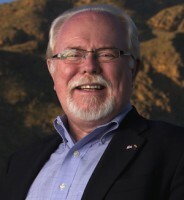 Ron Barber has lived in Southern Arizona most of his life. He went to high school in Tucson, and graduated from the University of Arizona. He married his high school sweetheart, Nancy, and they raised their two girls there. Together they ran a small business, Toy Traders/Stork’s Nest, where families could buy and trade used toys, clothing, and equipment. He also worked for 35 years as an advocate for people with disabilities. As his website tells us, he ran one of the five most cost-efficient, high-quality family-service programs in the country. Wanting to continue his commitment to improving people’s lives and solving community problems, Barber headed up Congresswoman Gabrielle Giffords’ district operations in 2006. In that position, he got results by cutting through federal agency red tape for constituents. After the tragic shooting in Tucson in January 2011, Giffords stepped down from her position to focus on her recovery. Barber, less critically wounded in the shooting, recovered and was encouraged to run to fill the remainder of Giffords’ term, as well as to run for the next full term. With Gabrielle Giffords’ encouragement and endorsement, Barber accepted the opportunity to continue his commitment to public service. If you believe it is critical for the people of CD8 to have a strong proponent for women’s health care representing them in Washington, you might like to volunteer or contribute to his campaign. Please go to www.ronbarberforcongress.com to sign up to help. If you are registered to vote in CD8, you can request an early ballot here. This entry was posted in Elections and tagged 2011 Tucson shooting, 8th Congressional District, Arizona, birth control, CD8, Congressional District 8, Congresswoman Giffords, contraception, Democrat, early voting, election, Gabby Giffords, Gabrielle Giffords, general election, Jesse Kelly, Planned Parenthood, pro-choice, Rep. Giffords, Republicans, Ron Barber, Southern Arizona, special election, Tucson, War on Women, women's health by Malinda B.. Bookmark the permalink.